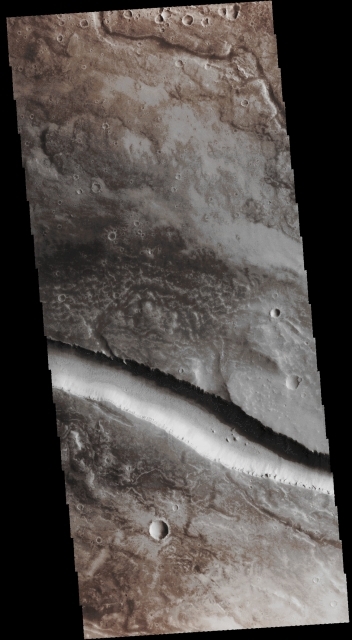 In this VIS image, taken by the NASA - Mars Odyssey Orbiter on December, 12th, 2015, and during its 62.082nd orbit around the Red Planet, we can see a (really small) portion of Granicus Valles. This extremely complicated Channels' System - approx. 750 Km (such as about 465,75 miles) long - is located to the West of the huge Martian Volcano known as Elysium Mons and, most likely, it was created by both Lava and Water (Out) Flows that were related to the (likely truly powerful) activity of the Elysium Mons Volcanic Complex itself. The linear nature, and (relatively) uniform width of the Channel visible here is (---> could be) indicative of a Fault-bounded Graben. The Plains surrounding this Feature are Volcanic in origin, and many parts of Granicus Valles appear to be made of by Channels carved by a flow of some kind of a thick liquid (perhaps Lava and Water, as we mentioned before). This image (which is an Original Mars Odyssey Orbiter b/w and Map Projected frame published on the NASA - Planetary Photojournal with the ID n. PIA 20262) has been additionally processed, magnified to aid the visibility of the details, extra-contrast enhanced and sharpened, Gamma corrected and then colorized in Absolute Natural Colors (such as the colors that a normal human eye would actually perceive if someone were onboard the NASA - Mars Odyssey Orbiter and then looked down, towards the Surface of Mars), by using an original technique created - and, in time, dramatically improved - by the Lunar Explorer Italia Team.